Thermoreception or thermoception is the sense by which an organism perceives the temperature of the external environment and the internal environment (body temperature). The process involves the impact made by heat energy (temperature) on specialized sense organs known as thermoreceptors, allowing living things to detect temperature. Living organisms are greatly impacted by temperature. Thermoreception reflects one aspect of the harmonious interaction between a living organism and its external and internal environment. The sensory capacity to detect hot and cold temperatures allows automatic homeostatic mechanisms in warm-blooded animals to adjust internal temperatures to keep them stable at desired levels; it allows cold-blooded animals to adjust their behavior in ways favorable to those organisms. 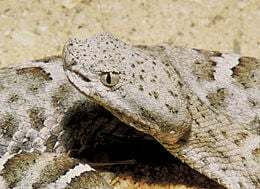 Some snakes, such as pit vipers and boas, can use temperature detection to detect the direction and distance of a heat source (perhaps a warm-blooded prey) and insects like the beetle Melanophilia acuminata can use heat detection to find suitable locations to lay its eggs or the bug Triatoma infestans to locate a blood source. Thermoreception is the sense of temperature. Specialized cellular sense receptors (thermoreceptors) allow the detection of cold and hot temperatures. In vertebrates, most thermoreception is done by the skin, perhaps via some free nerve endings. The details of how temperature receptors work is still being investigated. Mammals have at least two types of sensors: those that detect heat (i.e. temperatures above body temperature), and those that detect cold (i.e. temperatures below body temperature). (There are also nociceptors that detect pain if the cold or heat is extreme enough to pass a certain threshold.) Determining which receptors do thermoreception has been particularly difficult and various individuals have speculated that some mechanoreceptors also may do thermoreception (HCPD 2007). A particularly specialized form of thermoception is used by Crotalinae (pit viper) and Boidae (boa) snakes, which can effectively see the infrared radiation emitted by hot objects. The snake's face has a pair of holes, or pits, lined with temperature sensors. The sensors indirectly detect infrared radiation by its heating effect on the skin inside the pit. They can work out which part of the pit is hottest, and therefore the direction of the heat source, which could be a warm-blooded prey animal. By combining information from both pits, the snake can also estimate the distance of the object and perhaps even the size. The common vampire bat may also have specialized infrared sensors on its nose (Goscilo and Petrov 1999). A nucleus has been found in the brain of vampire bats that has a similar position and has similar histology to the infrared nucleus of infrared sensitive snakes. Other animals with specialized heat detectors are forest fire seeking beetles (Melanophilia acuminata), which lay their eggs in conifers freshly killed by forest fires. Darkly pigmented butterflies Pachliopta aristolochiae and Troides rhadamathus use specialized heat detectors to avoid damage while basking. Blood sucking bugs Triatoma infestans may also have a specialized thermoreception organs. A thermoreceptor is a sensory receptor, or more accurately the receptive portion of a sensory neuron, that codes absolute and relative changes in temperature, primarily within the innocuous range. In the mammalian peripheral nervous system warmth receptors are thought to be unmyelinated C-fibres (low conduction velocity), while those responding to cold have thinly myelinated Aδ axons (faster conduction velocity). The adequate stimulus for a warm receptor is warming, which results in an increase in their action potential discharge rate. Cooling results in a decrease in warm receptor discharge rate. For cold receptors, their firing rate increases during cooling and decreases during warming. Some cold receptors also respond with a brief action potential discharge to high temperatures, i.e. typically above 45°C, and this is known as a paradoxical response to heat. The mechanism responsible for this behavior has not been determined. A special form of thermoreceptor is found in some snakes (the viper pit organ, for example) and this specialized structure is sensitive to energy in the infrared part of the spectrum. In mammals, temperature receptors innervate various tissues, including the skin (as cutaneous receptors), cornea, and bladder. Neurons from the pre-optic and hypothalamic regions of the brain that respond to small changes in temperature have also been described, providing information on core temperature. The hypothalamus is involved in thermoregulation, the thermoreceptors allowing feed-forward responses to a predicted change in core body temperature in response to changing environmental conditions. Cold-sensitive thermoreceptors give rise to the sensations of cooling, cold, and freshness. In the cornea, cold receptors are thought to respond with an increase in firing rate to cooling produced by evaporation of lacrimal fluid "tears" and thereby to elicit a reflex blink. Warm and cold receptors play a part in sensing innocuous environmental temperature. Temperatures likely to damage an organism are sensed by sub-categories of nociceptors that may respond to noxious cold, noxious heat, or more than one noxious stimulus modality (i.e they are polymodal). The nerve endings of sensory neurons that respond preferentially to cooling are found in moderate density in the skin but also occur in relatively high spatial density in facial skin, cornea, tongue, and strangely enough the bladder. The speculation is that lingual cold receptors deliver information that modulates the sense of taste, cold lemonade tastes pretty good, but cold gravy is not so tasty. This area of research has recently received considerable attention with the identification of the Transient Receptor Potential (TRP) family of proteins. The transduction of temperature in cold receptors is mediated in part by the TRPM8 channel. This channel passes a mixed inward cationic (predominantly carried by Ca2+ ions) current of a magnitude that is inversely proportional to temperature. The channel is sensitive over a temperature range spanning about 10-35°C. Another molecular component of cold transduction is the temperature dependence of so-called leak channels, which pass an outward current carried by potassium ions. Some leak channels derive from the family of two-pore (2P) domain potassium channels. Among the various members of the 2P-domain channels, some close quite promptly at temperatures less than about 28°C (eg. TRAAK, TREK). Campbell, A., R. R. Naik, L. Sowards, and M. O. Stone. 2002. Biological infrared imaging and sensing Micron 33: 211-225. Retrieved January 7, 2008. Goscilo, H., and P. Petrov. 1999. The vampire bat University of Pittsburgh. Retrieved January 7, 2008. Hanover College Psychology Department (HCPD). 2007. Chapter 12: The skin senses Hanover College. Retrieved January 7, 2008..
Kishida, R., R. C. Goris, S. Terashima, and J. L. Dubbeldam. 1984. A suspected infrared-recipient nucleus in the brainstem of the vampire bat, Desmodus rotundus. Brain Res. 322: 351-355. This page was last modified on 2 April 2008, at 17:40.